Yesterday I was lucky enjoy to tag along with the JATA (Jandakot Airport Tragics Association) boys on a lunch run to Jurien Bay. It was 3 Mooney formation. Once again it left me busting to be behind the controls flying cross country. To make the next small step towards that, it was down to Jandakot again today to do a lesson on performance circuits. Performance Circuits focus on the techniques for short field take-off and landings then onto soft field take-off and landings. To spice it up we added a low level circuit too… ooohhh! The landing is similar to your regular landing except from 400ft above the groun you slow from 65knots to 60, then down to 55 over the fence of the airfield. Your goal is to land right on the piano keys at the start of the runway. Then its heavy braking till you stop in the shortest distance. With each landing we came to a complete stop before doing the take-off technique again. We did about 3 of these then swapped to the soft field landing technique. Soft field is similar except you apply full back elevator to try and lift the front wheel off the ground. Once it is off you balance the plane on the rear wheels in a wheely till the plane gets itself off the ground. Once off the runway, you lower the nose a little till the speed comes up and climb away as normal. The landing is almost the same as the short field landing except you hold the nose wheel off the ground as long as possible and don’t use your brakes. With the wind at barely 5knots, it was smooth and fun. The only downside, all the runways at Jandakot are bitumen, so there were no grass runways to try it on. Lucky last we did a low level circuit, having been denied on previous circuit lessons when we requested it. Instead of climbing to 1000ft we do the circuit at 500ft above the ground. It is more curved and tighter than a regular circuit, basically you keep closer to the runway in case you engine dies. It was fun! 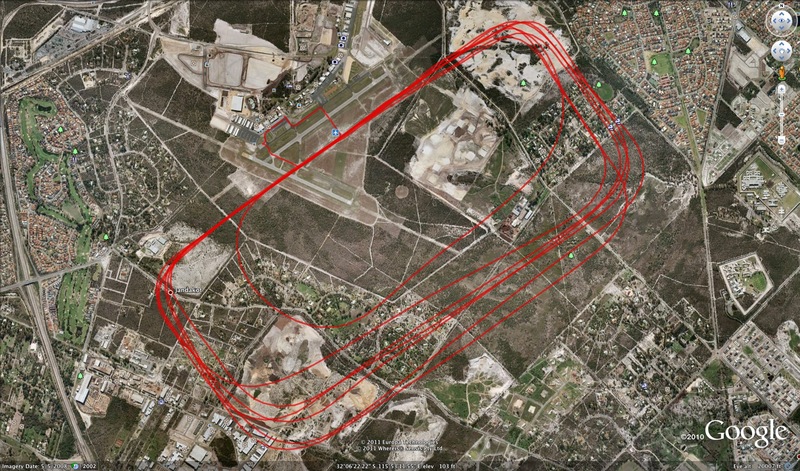 This entry was posted in cessna 152, Circuits, Jandakot. Bookmark the permalink.